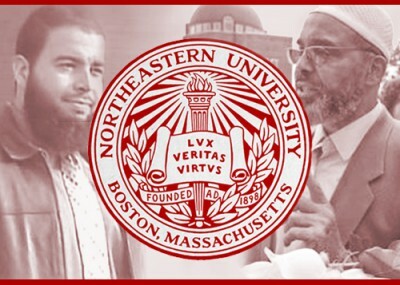 Northeastern University isn't commenting about concerns regarding its Muslim chaplain, despite his recorded statements praising an attempted attack on American forces in Afghanistan as "brave" and his earlier call for Muslims to "grab on to the gun and the sword" to fight injustice. On Monday, the Investigative Project on Terrorism reported on remarks Abdullah Faaruuq made during a Dec. 8 fundraiser for Aafia Siddiqui, also known as "Lady al-Qaida." Siddiqui, an MIT-educated neuroscientist, was arrested by Afghan officials in 2008, who found notes about mass casualty attacks in her possession. During questioning by U.S. officials, she grabbed an Army officer's M-4 rifle and fired it at the Americans. "What a brave woman she is," Faaruuq said at the fundraiser. "What a brave woman she continues to be, and how much her bravery and her faith and her belief warrants our support at this time." Had his mother been in Siddiqui's shoes, "she would have took (sic) her West Indian machete and cut her way through those kafirs [unbelievers]." Siddiqui was convicted of attempted murder and is serving an 86-year prison sentence. The IPT contacted university spokesmen Monday afternoon, asking whether Faaruuq's endorsement of Siddiqui's actions and other radical statements make him an appropriate person to provide spiritual counseling to Northeastern students. The university has not responded. Jurors in Boston on Tuesday added another entry to the list of convicted terrorists Faaruuq supports. Tarek Mehanna was convicted on four counts related to his desire to provide support to al-Qaida and three counts of lying to federal investigators. Faaruuq serves on a Free Tarek Mehanna committee. A former friend who struck a deal with prosecutors testified about a 2004 trip he and Mehanna made to Yemen in hopes of attending a terrorist training camp. They planned to go to Iraq after that to fight American troops. When that didn't work, Mehanna came back to the United States and translated jihadi videos, including al-Qaida's "39 Ways to Make Jihad." Defense attorneys argued the work was protected free speech. But prosecutor Aloke Chakravarty told jurors the translations provided terrorists "training material to get ready to serve and participate in that fight." Siddiqui and Mehanna are "Muslims who are being oppressed," Faaruuq said at the recent fundraiser. "And you might well be one of those too if you don't pay careful attention this evening to what I am going to say to you." Northeastern "should remove him from the position [as chaplain] and ban him from the University for teaching students radical, hateful ideas," said Charles Jacobs, president of Americans for Peace and Tolerance, which has tracked Faaruuq's actions. That includes a March 2010 recording urging Muslims to "grab on to the gun and the sword" as part of the struggle for justice. At the fundraiser earlier this month, Faaruuq denied he was urging violence if peaceful measures failed. "And now we know there are other ways of fighting other than picking up a sword," he said, "like spending your time and your money, like spending your time and your money." In an email, Jacobs said Faaruuq crossed a line from unpopular speech to "fund raising for a convicted terrorist, and praising her for grabbing a machine gun to murder people." "Has the university informed the parents of the Muslim students that they are being spiritually led by someone who supports terrorism, who gleefully states that if his mother would have been with the terrorist Aafia Sadiqui, she would have picked up a machete and attacked those kaffirs?" Jacobs wrote. "Is this what N.E. University wants its Muslim students to learn? This is a spiritual advisor?" Regardless of his opinions on the Siddiqui and Mehanna cases, Faaruuq should be shocked that people he knew from the community turned so radical, Jacobs said. A moderate chaplain would "be very worried that such radical, hateful, anti-American teachings are getting into his moderate community. He'd have a plan to monitor that and to stop it." Faaruuq's introduction at the fundraiser also indicated that he was a prison chaplain in Massachusetts for nine years. Despite a global population of more than 1 billion, Muslims are "cowering at the hand of the disbeliever," he told the Dec. 8 fundraiser. Siddiqui's case is an example. "And I say they call this the land of the free and the home of the brave," Faaruuq said. "And I call it the land of the coward and the home of the slave." if freedom of speech protects him, and he can preach all this with impunity..does that mean i as a christian can say i will take up my gun and sword and destroy the indoctrinated brain washed misogyinistic fanatics, who fear education..and freedom of speech..as this exposes them to the light of reason..and truth..if they can call for my death..i can call for theirs..when are the leaders going to man up and return these people to where they belong..there will never be peace..there never has been peace..the russians lost 50,000 men fighting these cave men..seems to me great britain and the usa will not be happy, until they to have lost as many..pull out..leave them to their tent wars..
And yet..... There's not even a peep from the Greater Boston academic or religious community; let alone those apparati that once served in the filed of counter-subversion. "Had his mother been in Siddiqui's shoes, "she would have took (sic) her West Indian machete and cut her way through those kafirs [unbelievers]. ""; leaves on wondering about two things; whho raised this fanatic; and was his "West Indian" mother Muslim? In the Eighties, Steve Emerson IPT was only heard and heeded by a few of us. And today, we still stumbling along in, not only, willful blindness, but selective deafness. Who gave entry visas for this terrorists?